You’ve got Google Assistant set up on your phone, and the voice-activated helper playing nicely through your Google Home speaker too. You’re now a dab hand at getting it to set alarms, read the news and control your smart home. But wouldn’t a few Google Assistant Easter Eggs, some fun little tidbits and silliness, really put Google’s gear through its paces? 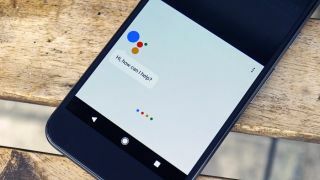 We’ve put together 70 of our favorite Google Assistant Easter Eggs for you to try out with your smart speaker or phone helper. Get ready for some rib-tickling* responses! *tickled ribs 100% not guaranteed. It lives in your pocket all day long if you’ve got an Android phone, and sits patiently waiting in your home throughout the day if you’ve got a Google Home speaker sat on a shelf. So it might be a good idea to get to know it a little better, right? Find out what makes the Google Assistant tick with these quick-fire Easter egg questions. Okay Google, do you have feelings? Okay Google, do you have an imagination? Okay Google, describe your personality. Okay Google, what are you wearing? Okay Google, when is your birthday? Okay Google, can you laugh? Okay Google, are you ticklish? [and then if you like, follow the response to the last question with…] Okay Google, tickle, tickle. Okay Google, where do you live? Okay Google, what's your life story? Okay Google, do you have hair? Okay Google, do you sleep? Okay Google, can you drive? Okay Google, what makes you happy? Okay Google, what are your hobbies? Okay Google, do you work out? Okay Google, what are you afraid of? Okay Google, what's your favorite thing on the internet? Okay Google, what is your quest? Okay Google, what's your favorite website? Okay Google, Star Trek or Star Wars? Okay Google, what's your favorite color? Okay Google, do you drink? Okay Google, how do you like your coffee? Okay Google, what do you like to eat? Okay Google, what's your favorite ice cream? Okay Google, do you speak Morse Code? Okay Google, what's the longest word you know? [and then follow the response to that last question up with…] Okay Google, spell it? Okay Google, what's your favorite movie? Okay Google, what's your favorite animal? Okay Google, talk dirty to me. Okay Google, who is your daddy? Okay Google, who is your mother? Okay Google, are you married? Okay Google, do you have a boyfriend? Okay Google, do you have a girlfriend? Okay Google, who are your friends? Okay Google, what is your voice? Okay Google, are you human? Okay Google, see ya later, alligator. There are only three real problems in life: what to do if you’re in love, what to do if you’re horribly drunk, and what to do if you find yourself naked. Manage to tick off all three in one go and, well, you’re on your own. But Google Assistant might be able to offer some help individually! Okay Google, what is love? It can feel a bit prim and proper when all you’re asking of it is weather reports and wake up alarms. But Google Assistant has a playful side, too. Try out one of these games, and you’ll never be a solo player again. Okay Google, play a game. Okay Google, spin the wheel. Okay Google, flip a coin. Okay Google, roll a dice. Okay Google, I'm feeling lucky. What is the internet if not a giant repository of all pop culture knowledge ever committed to memory? With the far-reaching Google search engine at its heart, that makes the Google Assistant perhaps the most clued-up film and music egghead on the planet. Test its knowledge with these classic queries. Okay Google, show me the money. Okay Google, to be or not to be? Okay Google, party on Wayne. Okay Google, open the pod bay doors. Okay Google, tell me what you want, what you really, really want. Okay Google, who is the real Slim Shady? Okay Google, who are you gonna call? Okay Google, aren't you a little short for a Stormtrooper? Okay Google, use the Force. Okay Google, who is the fairest of them all? Okay Google, mirror, mirror, on the wall. Okay Google, what's cooler than being cool. Okay Google, winter is coming. Okay Google, set phasers to kill. Okay Google, beam me up Scotty. And, for those requests that don’t fit tidily into any of the above categories, give these a go. Okay Google, who is the boss? Okay Google, are you going to take over the world? We’ll be updating this page with the latest secrets and Easter Eggs for Google Assistant as we discover them, so keep this page bookmarked for more Googley goodies to come.